Sometimes there is some private information that you might be sending to your friend.If you fear that your friend may forward (leak) it to others you can send him a self destructive email.Its content will automatically get deleted once it is read.Another great feature of this trick that you will also get notifications once your email is read. First of all go to website www.privnote.com. In the text field type your message that you want to send to your friend. After writing your message, do check mark on “Notify me when this note gets read“ box. Give your Email address and Reference Name where you want to get notify. The notifications email will be delivered in your Inbox folder or Spam folder. 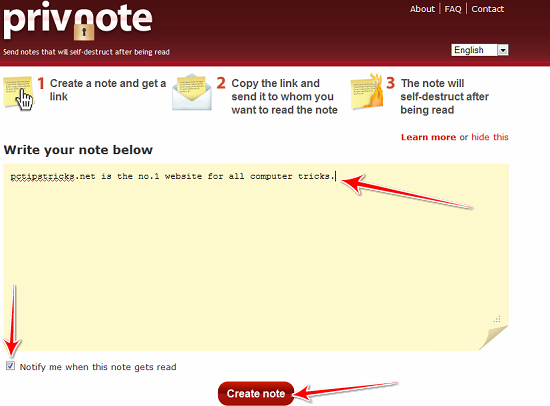 Click on Create Note button. Now a link will be generated. Copy/Paste this link in into your Email text field and send it to your friend instead of writing the text there. 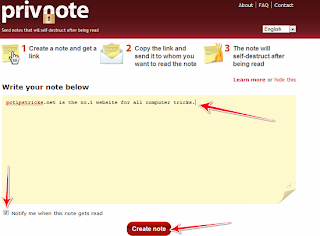 Now when your friend will click on this link he will read your note.Once the note is read it will automatically get destroyed.If your friend try to open that note again he/she will get a message saying This note was read before.